Large institutional investors and high-net-worth individuals have helped advance a new asset allocation model—one that introduces alternative investments to provide diversification and a hedge against rising inflation. While institutions have different goals and longer investment horizons, individual investors seeking similar benefits may choose to access alternative investments via non-traded real estate investment trusts (REITs) and non-traded business development companies (BDCs). 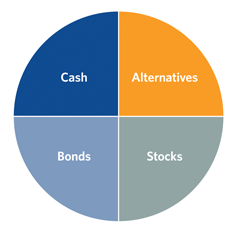 The traditional model of allocating investments to stocks, bonds and cash is widely available to individual investors. However, institutional and high-net-worth investors often leverage their wealth in search of diversification beyond traded markets and for returns from alternative assets and strategies. In doing so, these investors have helped advance a new allocation model that now includes less liquid, alternative investments. This model is increasingly available to individual investors. Alternative investments refer to non-traditional investments that fall outside of the common categories of stocks, bonds and cash. Some examples include real estate, loans made to private companies (private debt), private equity, infrastructure and energy investments. Asset classes represented will be used in differing amounts by individual investors to help meet their personal investment strategies. Chart is for illustrative purposes only. Institutions often invest on terms and conditions different from individual investors, particularly with regard to fees and expenses. That said, the inclusion of alternative investments in institutional portfolios has historically performed well. The Yale and Harvard endowments are two examples of this strategy in action. While allocations can vary widely between institutions, both portfolios contain a relatively high percentage of alternative, less liquid assets. Though the inclusion of alternatives is only one contributing factor in each endowment’s overall strategy and past performance is no guarantee of future results, ten-year historical investment returns have been strong, as evidenced by the graph above. Sources: “The Yale Endowment 2012 Performance,” 2013 Target Asset Allocations, September 2012. “Harvard Management Company Endowment Report Message from the CEO,” 2013 Policy Portfolio, September 2012. Stock and Bond Portfolio includes S&P 500 and CITI US BIG. Past performance is no guarantee of future results. Charts are for illustrative purposes only. CNL Securities is not affiliated with the Yale Endowment or Harvard Endowment. Non-traded alternatives may offer several potential benefits to an investor’s portfolio, such as diversification, low correlation, reduced portfolio volatility and an inflation hedge. Low Correlation – The cornerstone of portfolio diversification is the inclusion of low-correlated assets. If asset values have low correlation—or values that do not move up and down in tandem in response to market changes—the portfolio’s overall value is less impacted by movements in any one investment. Reduced Volatility – Another potential benefit is reduced portfolio volatility. For investors looking to mitigate some of the wide price swings of the stock market, alternative investments merit consideration. Historically, less liquid alternative assets such as real estate and private debt have been less prone to the wide price swings seen in traded domestic and international stocks. Inflation Hedge – Finally, alternative investments may serve as an inflation hedge. During historical periods of high inflation, hard assets have typically performed well. Additionally, alternative debt instruments may have floating rates, which allows interest income to increase as interest rates rise in response to inflation concerns. In the past, access to alternative investments was limited to institutional or high-net-worth investors. After all, direct ownership of alternative assets, such as a multimillion dollar piece of commercial real estate, can be costly. Considerable knowledge is often needed to navigate complex markets or industries. Additionally, the management of alternative assets typically requires significant time and resources. Alternative investment vehicles such as non-traded REITs and non-traded BDCs may provide individuals with similar retail investment opportunities to those available to institutional and high net-worth investors, while reducing some of these barriers to entry. 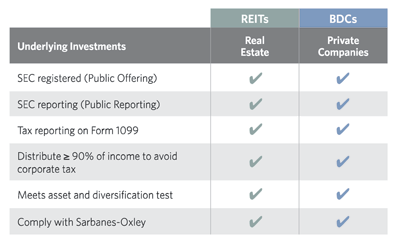 Both non-traded REITs and non-traded BDCs pool investors’ capital to make an investment—REITs in real estate and BDCs in the debt or equity of private companies. The REIT or BDC receives income in the form of earnings or interest payments. This taxable income is then passed along to the investor in the form of distributions. Non-traded REITs and non-traded BDCs must distribute at least 90% of their taxable income to qualify as a REIT or BDC and avoid corporate income tax. Both structures have similar regulation, transparency and tax treatment, though BDCs have an extra layer of regulation under the Investment Company Act of 1940. Limited liquidity – Non-traded alternatives offer limited liquidity, and liquidations may be less than the original amount invested. Additionally, their redemption plans are generally subject to suspension, modification and termination at any time, and early liquidation is often at a discount to the current share price. Complex and difficult to evaluate – Non-traded alternative investments may be more complex than traditional investments and a potential lack of independent ratings may make them more difficult to evaluate. Values can fluctuate – The values of non-traded alternative investments can move both up and down, with valuations occurring less frequently than traditional investments. In the case of non-traded REITs, portfolio valuations are infrequent and therefore maintain the established purchase price as the share price. This is not to be interpreted as evidence of stable underlying asset value because the value of the assets will fluctuate and may be worth less than the original purchase price. During the initial offering period the investment’s lack of transparency regarding share price can present challenges in finding a market in which investors can sell their shares. Investors should consult a financial professional to determine whether risks associated with an investment are compatible with his or her investment objectives. Non-traded REITs and non-traded BDCs are not suitable for all investors. Suitability standards can be found in a fund’s prospectus. Alternative investments such as non-traded REITs and non-traded BDCs may provide unique advantages. As access expands beyond high-net-worth and institutional investors, individuals are poised to potentially benefit from the diversification, low correlation, reduced portfolio volatility and inflation hedge that alternative investments can bring. For Investor Use – This information does not constitute a solicitation of an offer to sell/buy any specific security offering. Such an offering is made only by the applicable prospectus. A prospectus should be read carefully by an investor before investing. Investors are advised to consider investment objectives, risks, charges and expenses carefully before investing. There are no assurances an investment’s stated objectives will be achieved. Broker/dealers are reminded that communications sent to any person relating to specific securities must be accompanied or preceded by a prospectus in accordance with the Securities Act of 1933, as amended.